﻿​The sound of rain on the roof makes the idea of getting up and going for a run about as appealing as watching an episode of The Bachelor (actually I would happily run in a hurricane before doing that). Fortunately by the time I was leaving the house, the rain had less power than a Suzuki Swift. 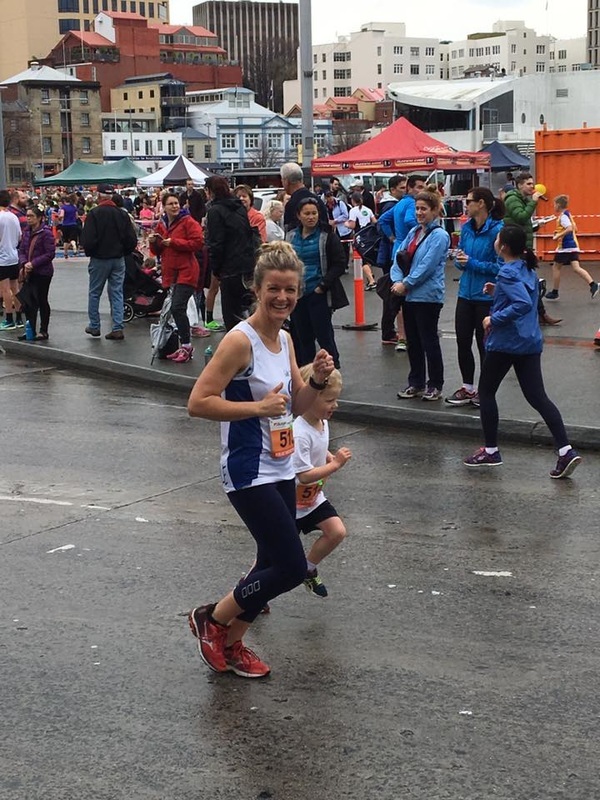 This was my first time running the Budget Hobart Fun Run and I was amazed at how abuzz the Hobart waterfront was in the hour before the event, especially with the drizzling rain still coming down. 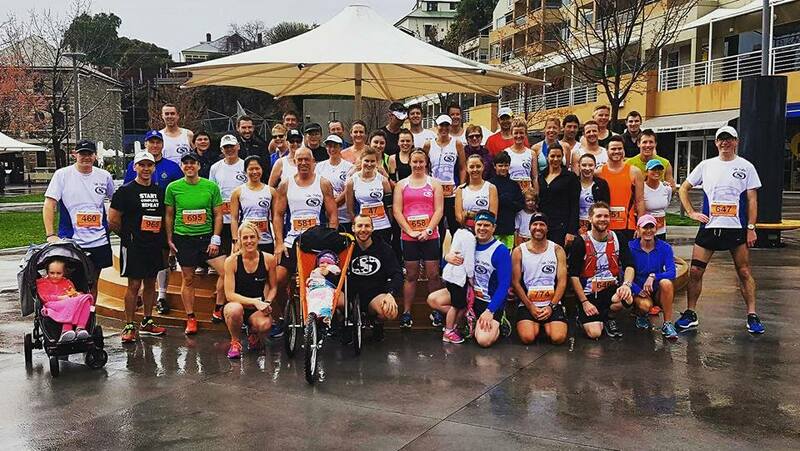 Then again, the event itself sold out well before the day so there was clearly a lot of interest and the Hobart waterfront is a beautiful spot to run. It was no surprise to see that the Solemates were out in force and even though I wasn’t registered as part of the SoleMates team I managed to sneak in for their customary pre-run photo. ​With 9:30 approaching, I finished a quick warm up and made my way over towards the start line. And it was here I met the Crafty McBeerface cheer squad who were decked out in custom tee-shirts and already making plenty of noise at this point in the morning. The man himself, who had stated that he believes the term, ‘fun run,’ is an oxymoron, was running to raise funds for Speak Up Stay ChatTY. However there was no sign of him at this point- obviously busy with official duties. The race started and I set off at a quick pace, trying to get a bit of clearance from the mass of humanity at the starting line. 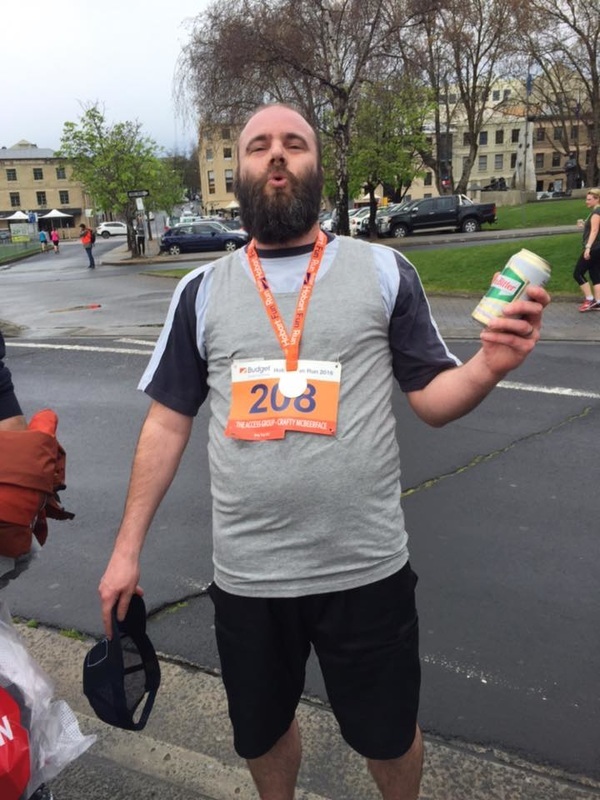 I haven’t actually run a 5km race before and it is a difficult race to run. It is too far not to pace yourself a bit, but the line between pacing yourself correctly and not pushing yourself hard enough is a little blurry (not in the creepy Robin Thicke way though). As with most races, I erred on the side of going harder early and leaving everything out on the track (I was obviously still quite impressionable when I first saw Racing Stripes), pushing myself really hard from the start and gradually slowing towards the end. We had hit the end of Salamanca place in what seemed the blink of an eye, turning to the right and following the water past Muirs. We crossed the second bridge onto the historic Hunter Street precinct, circling around the back of the Art School and past Hobart Brewing Company, and heading back towards Davey Street. By the time I hit Davey St I was starting to tire and Meriem Daoui cruised past me. Having seen her run at the Ross Marathon a fortnight ago, I knew better than to try to stick with her. The wet surface was a bit of a concern to me and demanded a fair bit of concentration, especially with low-friction metal sections that made your footing as insecure as Turnbull’s leadership. We followed Davey Street back for a few blocks before turning left into Argyle and then back towards Salamanca, with the Australian Army Band providing some great live music to keep people entertained. Even with a bit of a stitch, the tree-lined stretch of Salamanca is a lovely spot to run, especially when it is bringing you to the end of the first lap and past an awesome cheer squad. Now this cheersquad was primarily there for the great Crafty McBeerface, but they kindly made some noise for me as I went by too, helping me find another gear for a bit longer (or at least ‘til I was out of their sight). The turnaround point was a little bit hectic as their course split from their depending on whether one was running the 2.5km or 5km events. Coming up to it at speed, seeing people running in all directions it was about as confusing as the plot of Interstellar (can anyone actually explain that to me fully). It probably could have been better signed, but on the other hand I could probably have paid more attention to pre-race briefings, so I won’t think any further about who may have been to blame for my uncertainty. My second lap was definitely slower. I had been a little surprised how quickly fatigue had caught up with me and the difficulty level had also gone up with many more people to weave around on the course. The sharp turns weren’t doing me any favours, as I change course as easily as Corey Bernardi, but I kept battling away. My lovely wife, who had done her own 16km run earlier in the day so she could watch me run, noted that I didn’t have my happy face on in the second lap. However I did get a brief smile as I passed Brooke Street’s floating pier as I remembered that amazing wedding I went to recently that started with a cruise down to Peppermint Bay. By the time I hit Hunter Street for the second time it was clear I had misjudged my pacing and I was being overtaken semi-regularly by people who obviously knew how to run this distance better. For all that I was on a time that was a bit quicker than I had thought I would manage, so I knew if I just fought through to the end I would be really happy with the result. ﻿﻿﻿​﻿I hit Salamanca for the final time feeling really spent. Skinny Gene ran past me and I considered accelerating to try to keep up. That thought lasted about as long as a Brittany Spears marriage, as I realised I simply did not have the power to keep going. I did my final turn near the Silos and ran the last couple of hundred metres back to the finish line, which was situated in front of the Macquarie Point shed. I gratefully came to a stop but forgot to tell my watch to stop timing for another half a minute. This may seem a minor oversight, but when everyone you see straight after the race asks about your time, it is a bit of a pain not knowing, so I won’t make that mistake again (click here for results taken by people who are obviously more qualified at timekeeping than myself). I then made my way over to the Crafty McBeerface cheer squad to get an update on his progress. He wasn’t too far away either. One of the cheer squad had run up to 9/11 to get him a beer for when he finished and everyone was in good spirits. 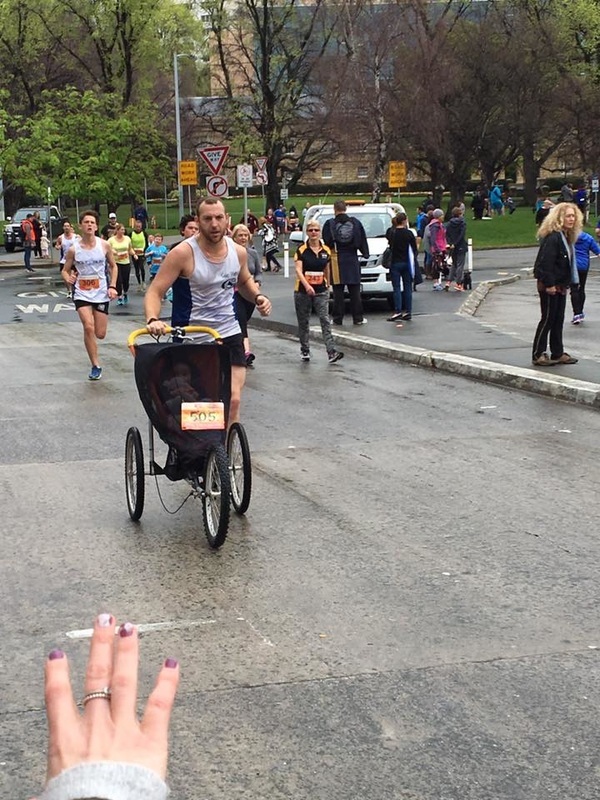 Crafty rounded the corner, resplendent in his hipster beard, and made his way up Salamanca Place to loud cheers from supporters who quickly crossed the track to cheer him in to the end. The race announcer wasn’t totally thrilled when Crafty diverted to collect the waiting beer before crossing the finish line, but he took it in good spirit. There had been some great spirit about the event. Check out this video by SaBaR showing some moments from the day. After the race it was only logical that we went for brunch, which then became lunch and afternoon drinks as we settled in for a nice little Sunday session to celebrate the day and the joys of living in our wonderful city.